We provide you with a great selection of Kits for whatever jewelry you are interested in creating. Shop through all of our selections of kits and choose the one that's right for you! Our Accent Silver Starter Kit includes all the tools and supplies you need to apply and fire Accent Silver ™ by Jewelry Material Innovation to brass, bronze and copper including a steel firing box with activated carbon, a full size jar of Accent Silver powder (5 grams), and 10 brass practice pieces, complete instructions plus our Metal Polishing Guide for great finishes. Get your message across fast and easy with help from the Cools Tools AlphaDisc Kit. Our lettering system kit is a great way to add custom type to your metal clay jewelry projects. This kit has everything you need to add unique and personalized writing to any piece. This kit includes 14 and 18 point font, a lettering and numbering disc, a lettering ring, instructions and more! Choose from several font styles to fit any metal or polymer clay jewelry preference! Watch exclusive videos and "how to" guides free online. Cools Tools offers the Bead Firing Kit to better help in understanding this method. 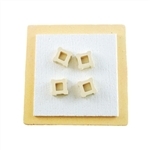 Our kit consists of a high-temperature fused silica firing dish filled with your choice of firing media. Finishing your jewelry pieces with a beautiful shine is one of the most important and valuable skills to have. Our Foredom Bench Lathe kit includes the parts and accessories to get started. Use our BRONZclay & COPPRclay Kits to create beautiful pieces of jewelry. Our kits offer the essentials for making Bronze and Copper Metal Clay jewelry. These Kits Provide the basic tools needed to get started. Carbon Firing Kits Our Firing kits give you everything needed to fire metal clay. Each kit includes a firing pan, slotted slid and your choice of carbon (Coconut or Coal). This is a great kit from Sherri Haab designed for easy electroforming and plating. The E3-eform controller is unique because it automatically regulates and maintains the current keeping it at a constant level to insure smooth plating. The controller is small, portable and can be used instead of a traditional plating rectifier. Our E3 Etch Kit by Sherri Haab contains everything you need to get started etching on copper. A great kit for jewelers looking to create crisp neat designs in no time. Enameling is a great way to add color to your creations. Our Cool Tools Enameling Kit features everything from safety supplies to finishing tools. 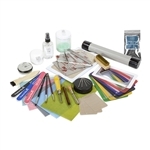 This kit has all the basic tools you will need when working with enamels. Make flexible clay in seconds simply by adding a few drops of glycerine to lump form PMC silver clay. This kit includes everything you need to make clay that stays flexible after it dries. This kit is a great value for the serious jewelry artist. The Foredom 2230 Kit includes the SR motor used and favored in the jewelry industry world wide. The Accessory Kit consists of a 54 pc. assortment of professional jewelers accessories. You'll find Trizact bands, ScotchBrite EXL wheels, silicone wheels and polishers, brushes and more. This kit also includes Rotating Bur and Tool Holder for 3/32" shank accessories and a tube of shaft grease. Add colorful and beautiful glass to your metal clay jewelry projects with help from our Glass Clay Kits. Create stunning pendants, fashionable earrings, snazzy bracelets, and much more. This is the easiest how-to-fuse kit you will ever find. A great kit for young adults and grown-ups who want to learn a craft they will enjoy for a lifetime! The ITS (Image and Color Transfer Solution) kit is a transfer medium that allows you to transfer images onto metal and other non-porous surfaces. This product produces soft transparent images allowing the metal (or other surface) to shine through what used to be the unprinted, or "white," area of the copied image. Use this kit to remove dust, specks and particles from stones prior to firing and from jewelry and stones prior to photographing for a professional look. This kit includes the basic kiln furniture and supplies for silver clay firing. Included in the kit is a hard ceramic kiln shelf, a set of 4 1" high kiln posts, a fiber blanket, and a package of Thinfire paper. Find the right Metal Clay Tool Kit to fit your needs. We offer the Metal Clay Basic Tool Kits to get you started creating beautiful silver jewelry. This kit includes the essential tools you'll use in all your metal clay work. The Deluxe kit is for those serious about becoming a metal clay jewelry artist. We’ve included everything you need to create in any kind of metal clay from forming to finishing….even the kiln! Discover carbon firing without the mess. Cool Tools offers a No-Flake Firing Foil Kit that comes with everything you need to eliminate flaking inside your kiln. The kit includes our No-Flake Firing Foil and our Coconut Activated Carbon that is perfect for firing all types of metal clay and gemstones. Note: Not all gemstones can be fired in metal clay due to temperature sensitivities. Please refer to our Gemstone Firing Guide. This is the easiest system to make your own custom textures and stamps. It takes just 5 minutes from start to finish. Make stamps from any artwork! You can also use your light to harden UV gel for jewelry making. The kit uses an ordinary light bulb to cure special packets of light sensitive photopolymer liquid into clear "rubber" stamps. Find what you need to make your jewelry projects shine with our Polishing and Patina Kits. Select the personalized kit for you to add a great finish to your metal clay pieces. Our Ring Forming & Sizing Kit contains all the essential tools you need to form and size rings. Just choose whole or half size and be on your way to gorgeous rings. The Ring Forming & Sizing Kit includes: A Multi-Mandrel stand, set of mandrels in sizes 4 through 15, Plastic Ring Style Finger Gauge, Ring Sizer Pellet Mold, 1lb of Ultra-Smooth investment (which makes about 80 Ring Sizer Pellets), and instructions. Our riveting systems by Crafted Findings are designed to pierce and set semi-tubular rivets. The riveting system has a piercing tool on one end that creates the hole for rivets and a flaring tool on the other end that precisely and cleanly sets rivets. Can pierce through 12 gauge or thicker. The riveting system includes a rivet sample pack. Choose from 1/16" or 3/32" rivet diameter systems. Our Safety kit includes clear polycarbonate safety glasses, a roll of 3M Vet Wrap tape, 3 soft foam ear plug sets, and 3M particulate respirators. Get started soldering with this great value kit! Precious Metal Clay is easy to solder. We include everything you need to learn to successfully solder metal clay, sterling silver, copper and gold. Our Torch Firing Kits include most everything you need to get started dabbling in Metal Clay jewelry making. The Torch Firing Kits include the Micro Torch adjustable flame butane torch, firing tripod with stainless mesh screen, fiberboard and fiber-grip tweezers.